The Australian Open[a][b] is an annual tennis tournament created in 1905 and played on outdoor hard courts[c][d] at Melbourne Park in Melbourne, Australia. American Serena Williams is a five-time champion, which is an Open Era record. a Known as the Australasian Championships (1905–1926) and as the Australian Championships (1927–1968) during the Amateur Era. b The tournament entered the Open Era with the 1969 edition, allowing professional players to compete alongside amateurs. c Since 1988, Rod Laver Arena features a retractable roof and lights, allowing indoor and night-time play. d The Australian Open specifically uses Plexicushion Prestige hard courts, categorized as a "Medium" speed surface by the International Tennis Federation (ITF). e The tournament was not held in 1986 because of a date change. See 1986 Australian Open tournament. f Each year is linked to an article about that particular event's draw. g The tournament was not held from 1941 to 1945 because of World War II. h Martina Navratilova was born in Czechoslovakia, but she competed as an American because she sought asylum in the United States, which made her have to relenquished her Czechoslovakian citizenship, so after the US Open in 1975 she competed as an American. i Two Australian Opens were in held in 1977 because of a date change, the first in January and the second in December. j Three wins by players from the United Kingdom of Great Britain and Northern Ireland (1922–present). k Czechoslovakia (TCH, 1918–1992), does not include the totals of Czech Republic (CZE, 1992–present) and Slovakia (SVK, 1992–present). 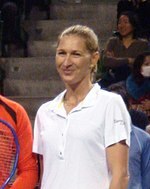 l Monica Seles won her first three titles as a Yugoslavian, but the last one was won as an American after gaining citizenship. m FRG is West Germany, but after unification (1990) became just Germany(GER). ↑ "Tournament profile - Australian Open". atpworldtour.com. ATP Tour, Inc. Retrieved 2009-07-05. ↑ 2.0 2.1 2.2 2.3 "Women's Singles". australianopen.com. IBM. Retrieved 2009-02-06. ↑ "List of Classified Court Surfaces". itftennis.com. ITF Licensing. Retrieved 2009-08-01. Àtunṣe ojúewé yi gbẹ̀yìn wáyé ni ọjọ́ 31 Oṣù Kínní 2015, ni ago 12:48.